Update on Dec. 24: new top score from saucy! I may set up a separate table for those playing NES or PCE versions, since the game is very different when chopped. Last edited by professor ganson on Mon Feb 13, 2012 10:25 pm, edited 13 times in total. a better score. i got to the end boss on my first life, unexpectedly died, died thrice on the restart point and then cleared the loop. i've no idea what i'm doing on the second loop yet so i died quickly. This is the exact old score recorded in the arcade in the late 80s. The board was taken out before we could work on the 2-ALL . He did, during a shmups IRC weekly compo. 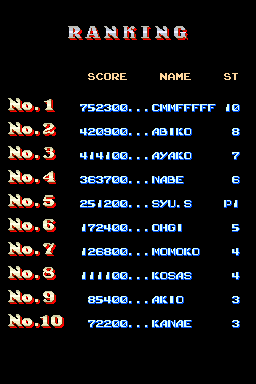 Incidentally, I managed a st10 run during that competition. The second loop is thoroughly evil. The second loop is thoroughly evil. ^Hmm, yes it must have been. It wasn't like us to leave things unfinished back in those days. just got this game, pretty cool.. hard too.. so far i especially like the 4th boss, very cool! are there any scoring tricks? add another 100K.. mulletgeezer im coming for you! Mind if I resurrect the thread? Just two more stages and you get the bad ending! I'm kicking myself for not recording this. I'll try to have a replay available sometime soon. Conquering the 2nd loop is a heavy achievement. I only spent about 3-4 weeks on this game when it was my local arcade (20 years ago), but I remember how fast and nasty the 2nd loop was. A replay of the 2nd loop would be great (not necessary, but great ). I like the way you did the Level 5 and 2-5 Boss. I'd forgotten how to do it. Excellent positioning and memorisation throughout. Went smoothly until half way through stage 9. I was fully expecting to get to 12 or 13, but I'm still losing my cool thanks to all the new snipers, and the fact that the big fat-arsed turrets now like to occupy all of the breathing spaces. By the way, does anybody know of any vids that show the last level being cleared without any 'Force' attachments? If I lose the ring lasers before I get there I'm usually humped. Nice score. Great to see activity on this board. At MARP, there's a 798,200 point replay by one YOS. He dies early in 1-8 and recovers. Since the required version of MAME is pretty ancient, you'll need to put midas11.dll and zlib.dll (google 'em) in the emulator folder. With careful positioning, you can destroy many of the guns that line the walls. When most are cleared, you need to charge in and afterburn the two guns underneath the search laser. To be safe, I wait for them to fire and then take advantage of their reload time. The rest is pretty straightforward. By memorizing where the flying robots appear, you can prevent the screen from becoming cluttered. I like to stick with the search laser for the boss, but almost everyone else switches to the barrier weapon. Thanks a lot! I've been playing the same way throughout the section in your video, except that I always forget about the afterburner attack, even though it's clearly a pretty invaluable move in a few places. I've been getting point-blanked now and then when picking up the search laser, but not any more! I don't know if I'll go much further, but I'm feeling rather addicted at the moment, hehe. Can you make a table for Image Fight II? Obviously this needs an update, and I'd be happy to add Image Fight 2. Go ahead and submit scores, but it'll take me a week or so to get back to this. Busy with work atm. If anyone wants to play this awesome sequel, make sure to pause the game before you kill the final boss, since you will not see your score again after the end of the game. The final boss is worth 30,000 points, so you can add that to your pre-kill score. Dunno if you are still updating scores but I got one. Really fun game. I can see how some developers took inspirations from it. With professor ganson's permission, this thread has been taken over. New thread is here.